QPR midfielder Gary O'Neil was standing on his own in the tunnel at Wembley, drinking a cup of tea and watching the final on a small monitor, when Bobby Zamora struck the last-gasp goal. The cup of tea promptly disappeared, O'Neil jumping up and down and celebrating on his own, while a short distance away out on the pitch his team-mates mobbed Zamora. Half an hour earlier as O'Neil had trudged off the wide-open spaces at Wembley, he had looked up at the banks of blue and white and wondered if the tackle on Johnny Russell that had resulted in the first red card of his 15-year career had cost Rangers promotion. It was the fans he felt for the most, the idea that he had let them down, had cost them their dream of bouncing back to the Premier League. As he walked off, team-mate Joey Barton gave him a hug and told him that he had done the right thing. O'Neil might not have been the last man but Russell had been through on goal and nobody else could have stopped him. 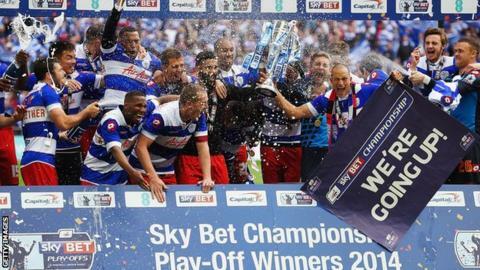 In the end, it stands as another example of how QPR found a way to win. Before a self-imposed break from Twitter at the start of May, Barton had started ending some of his tweets with #findaway. There was no finer example than that on Saturday, when Zamora's last-minute goal not only gave the striker his second winner in a Championship play-off final after West Ham's 2005 victory over Preston, but sealed an instant return to the Premier League for Rangers. It was Rangers' only attempt on goal in the game. At times on Saturday they resembled a scarred and bloodied ring veteran, gloves raised, resisting everything thrown at them in the hope of finding from somewhere deep within them one decisive and final blow. They were the side with the puncher's chance, who stayed in the contest long enough to catch their young and vibrant opponents. As boss Harry Redknapp admitted afterwards, they had been hanging on for grim death. Full-back Danny Simpson put it like this: "It was just one big dig, it's a great way to do it - smash and grab." Rangers' season has been a bit like that - often underwhelming but somehow hanging on and finding a way when it matters most. Sometimes the inspiration has come from the manager, who showed his worth in the second leg of the play-off semi-final against Wigan when he pushed Kevin Doyle up front to join Charlie Austin. It was a tactical tweak that changed the match. Rangers had been second best before that but were a team transformed. On Saturday it was the players who showed the steel and resolve to organise themselves in two banks of four and keep out their opponents. As Simpson explained afterwards, the players told themselves after losing O'Neil that with the match goalless they were still very much in it. It is the reason why 20-goal top striker Austin could be found in midfield for large periods of the final 20 minutes. Veteran defender Richard Dunne reckoned it showed that Rangers possess a feeling of togetherness that they have been accused of lacking at other points in the season. Rangers' squad boasts a staggering 4,264 Premier League appearances as opposed to a meagre 170 in the Derby squad. They needed all of that ring-craft because in the Rams they faced an opponent that, once over an initial stage fright, took the game to them and started to dominate even before O'Neil's dismissal. They say that styles make fights and what Saturday offered was a superb contrast; the veteran against the young pretender. The Rams played like they have done all season under Steve McClaren; with verve, speed and enthusiasm. Swift on the counter and remorseless in the way they attempted to smother their opponents, a welter of punches and aggression. Permanent: Tal Ben Haim, Loic Remy, Yun Suk-young, Chris Samba, Jermaine Jenas, Danny Simpson, Richard Dunne, Karl Henry, Charlie Austin, Gary O'Neil, Matty Philips, Javier Chevanton, Oguchi Onyewu, Yossi Benayoun, Coll Donaldson, Aaron Hughes. Loans: Andros Townsend, Benoit Assou-Ekotto, Tom Carroll, Niko Kranjcar, Guilherme Dellatorre, Kevin Doyle, Will Keane, Modibo Maiga, Ravel Morrison. If Derby were guilty of a safety-first approach under Nigel Clough, then they have been liberated under McClaren and now try to win games rather than avoid defeat. McClaren had started the season on the coaching staff at Rangers and he was dignified in defeat, applauding his old friends as they collected their trophy. He said before the game that Derby are ahead of schedule and they have much room for optimism. The club is now effectively debt free and their losses of £7.1m last season would comply within the Financial Fair Play boundaries set by the Football League for the current campaign. They play an attractive brand of football and have some excellent young players in the likes of 19-year-old Will Hughes and 22-year-old Jeff Hendrick. Even though they lost, their immediate future is arguably a lot more straightforward than that facing the victorious team. Derby can take a break, dust themselves down and start again. The situation at Rangers is a lot less certain. They lost £65.4m in the year 2012-13. Their turnover was £60.6m, their wage bill £78m. They have a debt of £177m. On 1 December they will have to submit accounts for the season just finished. If their losses are the same as those for the 2012-13 season they will face a fine of £54m, wiping out a substantial chunk of the £80m that Deloitte estimates promotion is worth for the club. There is speculation that it could result in a legal challenge but what is certain is that we will be hearing a lot more about Rangers and their finances over the coming months. They have numerous players out of contract, including O'Neil and Zamora, there are others - such as Adel Taarabt and Loic Remy - who are due back at the club after loan spells. Redknapp, who has signed 25 players either permanently or on loan since he took over in November 2012, is 67 and cannot continue indefinitely. Rangers might have won on Saturday but the victory does not answer all the questions surrounding the club; in some ways it just raises even more. As owner Tony Fernandes walked through the corridors at Wembley after his team's victory, trophy in one hand, bottle of beer in the other, he insisted: "I am just going to enjoy today, we've got to let the players enjoy it." Rangers are back where Fernandes wants them to be, but the job of sorting out the mess at Loftus Road is far from over.